Wind shear… it’s that mysterious quality of the wind that can make or break your strategy in a race. 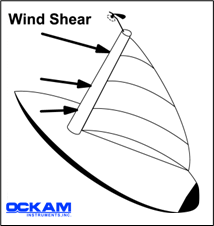 Many people measuring wind refuse to believe in the existence of wind shear, never mind its effects on sail trim. Much has been written on wind shear, especially here at Ockam. We have a clear understanding of it’s importance. It is a very real phenomenon that can be seen in sail trim (especially jib cars) and the wind information from an Ockam system. Many other instrument systems for measuring wind cannot reliably display the angle offsets that provide clues as to the presence of wind shear due the the method of calculating the wind solution, so many people refuse to believe its existence. The moment of epiphany for the Ockam system’s ability to detect shear came back when the America’s Cup was still in Newport, and it was a Block Island Race Week year. One syndicate was using SODAR to image the wind field prior to the warning signal. They also had the Ockam system installed. Several boats racing at Block Island (13 miles south of the Rhode Island coast) also had Ockam instruments. The boats with Ockam systems were seeing absurd tack-to-tack differences in wind angles, and the users were declaring them “useless pieces of junk.” However, the SODAR was imaging vertical wind shear at the same time. It dawned upon the shore crew analyzing the data that the tack-to-tack differences in wind angles were due to the effects of wind shear! After a little more examination of the data over many sailing days, it was determined to be a real effect. The crews who were able to recognize the existence of vertical wind shear went on to gain a tremendous advantage in racing. Short of using a SODAR, how can the ordinary person see wind shear? One of our customers has come up with a simple but ingenious device to demonstrate the absence or presence of vertical wind shear. He calls it the “Shear-O-meter“. It requires hauling a line up the mast without sails present, so it is most useful just before the race. During a race, it’s not practical to drop sails to check for shear. Also, some boats leave the harbor with the main already up to reduce problems out on the water. Here is the method for Determining Shear while racing. There is also an atmospheric mirage phenomenon called a Fata Morgana. The conditions that produce Fata Morgana are also ideal for producing vertical wind shear! Chances are, if you can see a Fata Morgana mirage, then there will be vertical wind shear. The conditions that form a superior mirage also tend to produce shear, although it may not be as pronounced. An inferior mirage indicates conditions opposite those that tend to produce vertical shear, but they are rarely seen over water. The absence of these optical phenomena does not indicate the absence of vertical wind shear. Their presence indicates the presence of the atmospheric structure that strongly promotes vertical wind shear – stratified surface layers with laminar flow.